What kind of rug is good for a geography classroom? 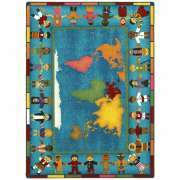 Map rugs with colorful graphics and maps offer a comfortable place to sit with the added benefits of an educational tool. Instead of having to point everything out with posters and illustrations you can easily use the carpet to help students understand concepts related to geography, history, maps and more. 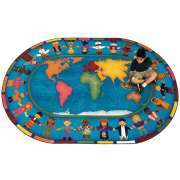 Geography rugs will fit well in any type of learning space, especially one where little ones are learning about countries and continents. You can choose from general maps of the world, more detailed maps and a map of America. many of the options also include flags or graphics which are fun and also educational as they are related to particular countries or regions. 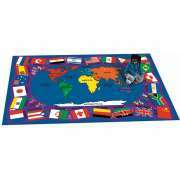 Geography rugs include large maps as well as related graphics that can support classroom learning connected to these topics. 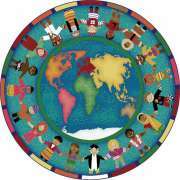 If your main goal is to promote cultural tolerance and teach about different customs and traditions, multicultural rugs which include a map of the world surrounded by children from various places holding hands is a great option. You can ask students to try to figure out what part of the world or country each child represents, which requires them to apply concepts about climate and diversity. 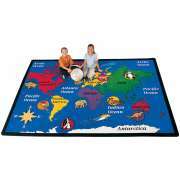 What kind of geography rugs can you get for a classroom? There are lots of options when it comes to map rugs, you just need to choose what you think is ideal for your space and students. Designs with flags around the border are colorful and fun, and also offer a great way to talk about symbols. Some of the flags might be familiar to students who come from various places around the world. Young learners can apply knowledge you have imparted to them in the classroom or test their previous knowledge by matching the flags to the right countries and then locating them in the right continent. Which maps can I get on a rug? Hertz Furniture has many map carpets which include a bird's-eye view of the whole world. We also offer a design which features a map of America with the borders of all of the states. The colorful design offers a great platform for educational games. Teachers can ask students to stand or sit by a certain state or region based on information that has been taught in previous lessons. Fun graphics which represent one thing each state is known for can be enjoyed as additional classroom decoration or used for lessons as well. While some map rugs are only available in one shape and size, we do have a number of styles with a choice. Before you select the style you want, make sure you know whether you want a rectangle, circle or oval, and what size is ideal for the space or spaces you would like it to fill.